Positive Behavior Interventions and Supports (PBIS) at Pleasant Grove High School has been implemented since 2014 and is currently functioning with Tier I interventions. 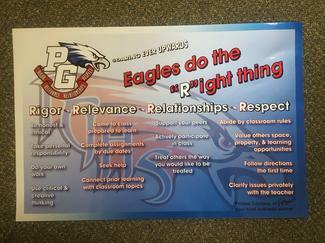 Our behavior expectations are for students to demonstrate Rigor, Relevance, Respect & Relationships in all areas on campus (review our behavior matrix), also known as the PG Way! PGHS students are acknowledged frequently for demonstrating the PG Way through Portfolio, Renaissance, Soaring Eagle Luncheons, Senior Perfect Attendance, and Validations. 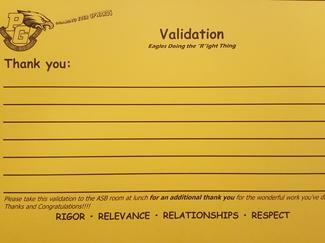 Teachers are acknowledged for demonstrating the PG Way through Validations, Sunshine Committee events, and Associated Student Body shout outs! Our discipline policies are clearly outlined in our Student Handbook and on our Behavior Matrix. Freshman students are taught the handbook by Vice Principals in a Q&A forum during their PE classes in the Fall and Spring Semester. Staff and students have committed instructional time to deliver lesson plans specific to the PG Way during Advocacy. The committee responsible for monitoring our outcomes of PBIS and Local Control Accountability Plan (LCAP) initiatives is known as the Eagle Alliance. We are proud to introduce our Cultural Ambassador, Kevin Williams. This is a position that was created last spring and is unique to PGHS. Mr. Williams is the proud parent of a PGHS alumni and an active member of the PGHS community. 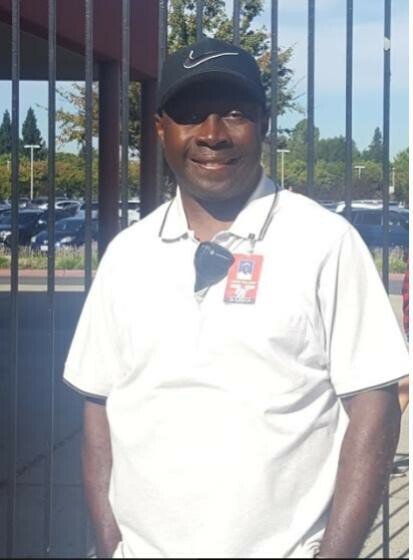 In his retirement from the Corrections Department in 2013 as a Correctional Captain, he decided to dedicate his time as a Campus Supervisor substitute in the EGUSD. He has always enjoyed working at PGHS and has developed connections with our students, staff, and community during his time on campus. His position as Cultural Ambassador was developed based on the needs of our students and campus. His primary role on campus is as a safe, approachable, and visible staff member who students can share their concerns and who acts as a liaison to administration. Additionally, Mr. Williams is one of the BSU advisors, participates in Unity Group, Unity Day, and other student activities. He is an asset to our campus and we are so pleased that he can be available to our students every day.